Nike's tech-toting LunarGlide 2+ trainers tested. Can technology really make us fitter? T3.com editor Kieran Alger is on a mission to find fitness tech that really help in the battle against the bulge. This week he puts Nike's tech-toting LunarGlide 2+ trainers through their paces. I have a confession. Last year I trained for the Paris Marathon almost exclusively in a pair of Nike Air running shoes. They soaked up the training miles reliably but I was never entirely happy with them. Despite the 'Air' monika they felt hard underfoot and the soles and cushioning didn't really do enough to prevent over 200 miles of pavement smashing up my shins and into my knees. So when race day arrived, against all the advice of seasoned marathon runners, I took a huge gamble. I ditched my Nike Air for a pair of Asics Gel Kinsei 3 – at the time Asics' top running shoe. I'd only worn the Asics on three previous runs but I felt more confident they'd perform than the Nike, even with the threat of blisters. So I swapped, ran and waited. By the time I crossed the line on the Champs Elysees in Paris I knew I'd made the right call. The Asics were a dream to run in. Soft, flexible, superbly light and comfortable throughout. It was like they weren't there and I was a convert to Asics. That experience meant that when I got the chance to try the new customisable Nike ID LunarGlide+ 2 trainers, I was already a sceptic. It woud take a lot more than a customisable colour scheme, or the chance to stitch witticisms onto the tongues, to convince me they could cope with the rigour of a marathon. The LunarGlide+ 2 were the first running trainers to be included in Nike's ID range. From heels and tongues through to the flywire and laces, pretty much everything is up for customisation for wannabe fashionistas. I did mine in-store and went for the subtle, classic look. Not everyone is restrained. I'm looking at you Mr Black-green-gold-red with orange laces. As with the other Nike ID shoes, you can also have custom messages stitched into the right and left tongue, although certain words are banned, like Adidas. I opted for an inspirational reminder of the task in hand. According to Nike, the LunarGlides' deliver better support than past runners bearing the Swoosh and are ideal for underpronators or moderate overpronators. A quick in-store gait test revealed that I neither under or overpronate, making these the best shoes for me. The inclusion of a Flywire panel, first introduced in 2008 for the Beijing Olympics, is supposed to make the shoes lighter but still durable, while inside, the “notched inner-sleeve construction” reduces irritation. Something you're going to appreciate on mile 22 if it's true. The final claim Nike makes is that the “Innovative Dynamic Support technology” would “adapt while you run to provide as-needed stability and cushioning”. In short, fixing that inflexible sole problem I'd found with the Nike Air. 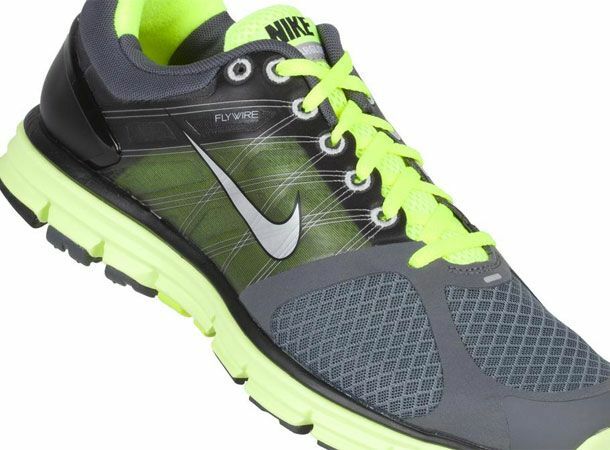 The LunarLite cushioning system also claims to give 'energy return', essentially putting a bit more spring in your step. In the past fortnight I've put the LunarGlides through a fairly tough test, covering around 40 miles of roads, treadmills and trails. I was looking for a pair or trainers I could be confident would help, not hinder, my running and be great every time I put them on, whether I was doing 2 miles or 20km. Momentum is a huge part of getting fit so the last thing you need are niggling blisters and sore feet disrupting your schedule and giving you an easy excuse to crawl back to the sofa. I also wanted to see if they could match the Asics Kinsei 3 for their straight-out-of-the-box comfort. They Nike LunarGlide+ hold up remarkably well under running's equivalent of a baptism of fire - a 13-mile half marathon along the Thames. The first thing you notice when you first slip them on is how light they are. After that it's all about what you don't notice and, just like the Asics, you barely know they're there. They mould to your feet, snug enough to make you feel secure but not too tight to bring about the rubbing that'll cause blisters over long distances. Under foot they certainly have more spring than my previous Nike Air shoes which suggests the LunarLite cushioning tech works. There's tangibly more give in the sole, reducing the shockwaves each step sends to the shins, which is vital if you're going to be on your feet for up to two hours at a stretch. If I had to make one criticism it'd be that my light grey design didn't hold up well against the muddy onslaught of the Thames towpath but then only I'm to blame for that. Mr Black-green-gold-red, maybe you were right.